MAPEGY (mapping data for your strategy) is a technology solutions provider. Our keystone product, SCOUT, is a technology intelligence platform that helps researchers, managers and decision makers to see tomorrow’s opportunities and threats, today. We are a Berlin based team of Data Scientists and consultants who are developing AI-backed algorithms that constantly analyze millions of data points on industries, companies, experts, technologies and trends. 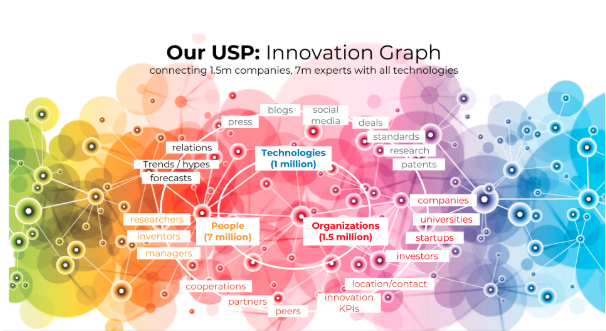 This data is stored in our unique Innovation Graph = a representation of the world’s digital innovation footprint. Our SCOUT taps into our extensive Innovation Graph, offering researchers, manager and decision makers all the power of big corporate intelligence at their fingertips. SCOUT offers a comprehensive overview of global technology advancements, at your fingertips. SCOUT is a highly sophisticated web-based SaaS platform that provides researchers, managers and decisions makers with data-driven facts and figures on global innovation dynamics. SCOUT’s intuitive layout and design makes accessing this information easy, streamlining processes and answering ‘WHO’ is doing the ‘WHAT’, ‘WHERE’, ‘WHEN’ and ‘HOW’ with the click of a button. SCOUT is built on MAPEGY’s unique Innovation Graph - a representation of the digital footprint of all innovators worldwide. The Innovation Graph is updated daily as our algorithms constantly map the billions of data points from patents, science and primary technology data, web and press publications. With access to an enormous, comprehensive information data pool, powerful visualizations, structured and connected insights, saving, alerting and bookmarking functionalities, and with an inbuilt collaborative workspace with reporting functionalities, SCOUT is a truly revolutionary tool that will transform your business and processes. 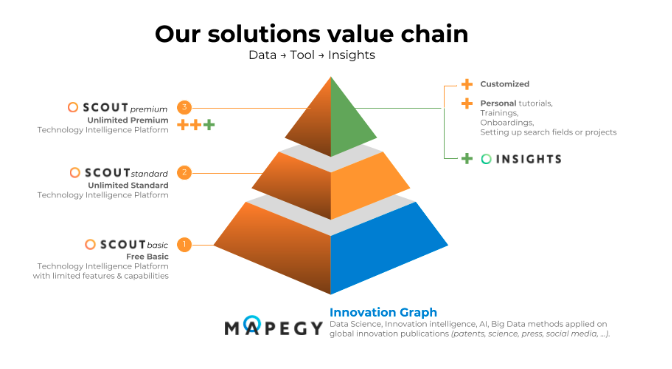 What is MAPEGY’s Innovation Graph? MAPEGY’s unique Innovation Graph is a representation of the digital footprint of all innovators worldwide. It is an immense and diverse database made up of the millions of organizations (companies, universities, startups, or investors) and experts (inventors, researchers, or managers) who are driving technologies and trends on a global and local scale. 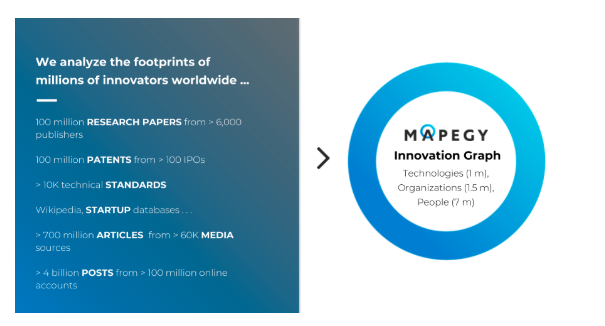 MAPEGY’s algorithms constantly analyze their footprints, updating the billions of data points not only from patents, science and primary technology data, but also web and press publications (see: Where does MAPEGY’s data come from? ), and map the data points to feed the Innovation Graph. Millions of companies and experts develop thousands of new ideas daily that change the world. Annually, worldwide R&D expenditures exceed €1,5 trillion, but billions are wasted due to a lack of sufficient insights at the right place and right time. Successful R&D requires advanced insights on technology developments, creative and time-devoted strategy, and quick time-to market. With its AI backed algorithms SCOUT provides Big Data analysis with visual analytics in an easy-to-use collaboration platform at your fingertips, relieving you from tedious, time-consuming tasks, allowing you to streamline your processes. What are MAPEGY.SCOUT’s use cases? SCOUT analyzes, identifies and monitors relevant topics (WHAT) and players (WHO) within your specified field of innovation, allowing you to get to market faster. Evaluating and reporting your results to your peers. What exactly does MAPEGY.SCOUT offer? Free Basic Technology Intelligence Platform with limited features & capabilities. Unlimited Standard Technology Intelligence Platform. SCOUT premium : Unlimited Premium Technology Intelligence Platform customized for customers’ use cases integrating additional innovation and business intelligence consulting under MAPEGY’s umbrella INSIGHTS. These services include setting up search queries, preparing reports, projects, presentations, or realizing workshops around innovation or technology management. MAPEGY solutions are used by innovators: Fortune 500 companies, consultancies and services providers as well as startups and individuals. Innovation & Technology Scouts as well as General Managers, Portfolio & R&D Managers who need comprehensive innovation insights on global technology dynamics regularly. Subject Matter Experts & Researchers who don’t have access to sufficient information on global technology dynamics and need regular insights and overviews quickly. Investors & Business Analysts who need accurate, concise insights into investment areas, key players and startups. Our customers are R&D heavy companies and their suppliers or service providers who need to stay ahead of the competition and on pulse of time. How will I benefit from your product/services? SCOUT gives our users and customers a competitive advantage through a better understanding of the market, allowing them to make better fact-based decisions. SCOUT saves costs, resources and time, and facilitates collaborative and strategic decision making. Where does MAPEGY.SCOUT’s data come from? over 10 thousand technical standards, and many other innovation related sources. Our data is updated and curated daily. MAPEGY uses AI backed algorithms to tap into the publicly available Big Data of the global innovation and technology dynamics (see: Where does MAPEGY’s data come from?). Our AI algorithms connect the dots between the million experts, managers, companies and organizations, million topics and technologies, and billion publications, projects and references that are regularly updated and fed into our Innovation Graph ( see: What is MAPEGY’s Innovation Graph). MAPEGY’s SCOUT is a Software as a Service solution that is the interface of our Innovation Graph, and allows our customers to explore and access the most relevant facts and figures related to their area of interest. SCOUT is not limited to innovation exploration but also provides alerting, saving, collaboration and reporting functionalities. MAPEGY’s AI algorithms, together with the intelligence, expertise and background knowledge of SCOUT’s users, transforms Big Data into valuable insights that fuel informed decision making. Is there a restriction on how many searches I can make? The sky’s the limit for innovation - SCOUT’s searches, alerts and projects are unlimited. Have fun and start to innovate!